August 2, 2018, Adrian, Michigan – Sister Janet Capone, OP, who served as Prioress of the Adrian Dominican Sisters from 1998 to 2004, died July 29, 2018, at the age of 80. 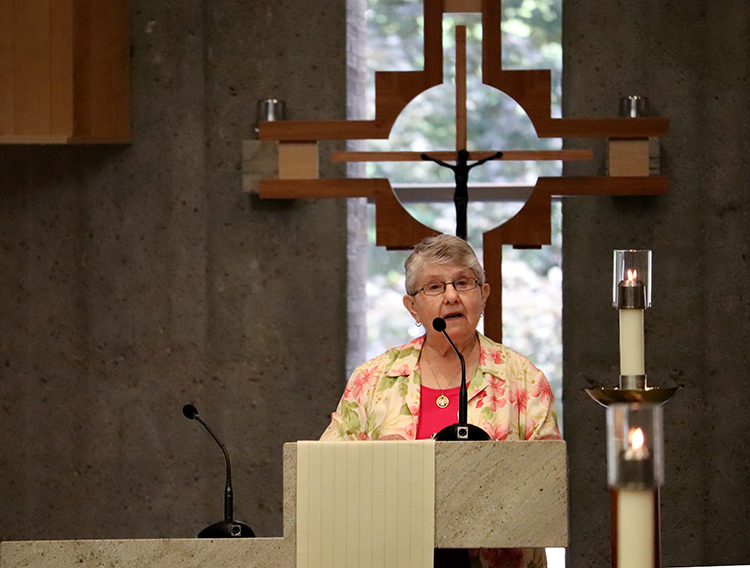 Sister Janet, whose religious name was Sister Mary Leonard, led the Congregation through a merger process with the Dominican Sisters of Edmonds, Washington, that culminated in their becoming part of the Adrian Dominican Sisters 15 years ago. The two congregations trace a common history to four Dominican nuns who came to the United States in 1853 from a monastery in Regensburg, Germany, to teach immigrant children. Both became independent religious congregations in 1923. Sister Michele Kopp, OP, left, Prioress of the Edmonds Dominican Sisters, and Sister Janet Capone, OP, process into church for the merger ceremony of the two Congregations. 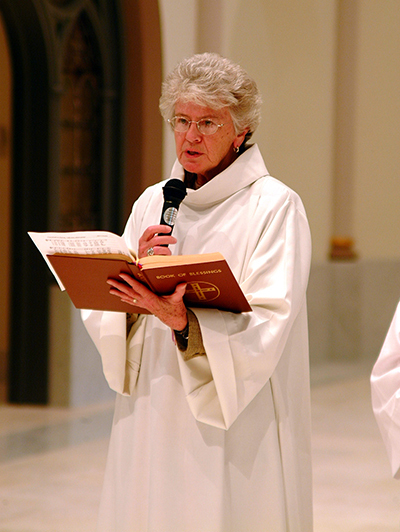 On June 14, 2003, Sister Janet and her counterpart, the late Sister Michele Kopp, OP, then Prioress of the Edmonds Dominican Sisters, co-led a ritual at a Eucharistic liturgy that united 55 Edmonds Dominicans with 980 Adrian Dominicans in a Congregation that numbered 1,035 members. 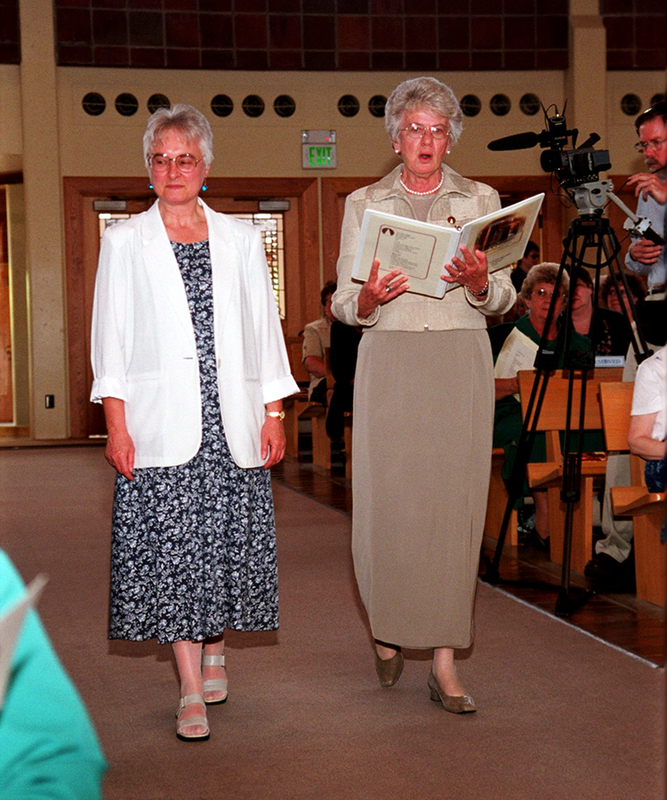 In 2002, prior to the merger, Sister Janet and the General Council hosted a Congregation-wide gathering of more than 1,000 Sisters, Associates, and guests – including members of the Edmonds Dominicans community. 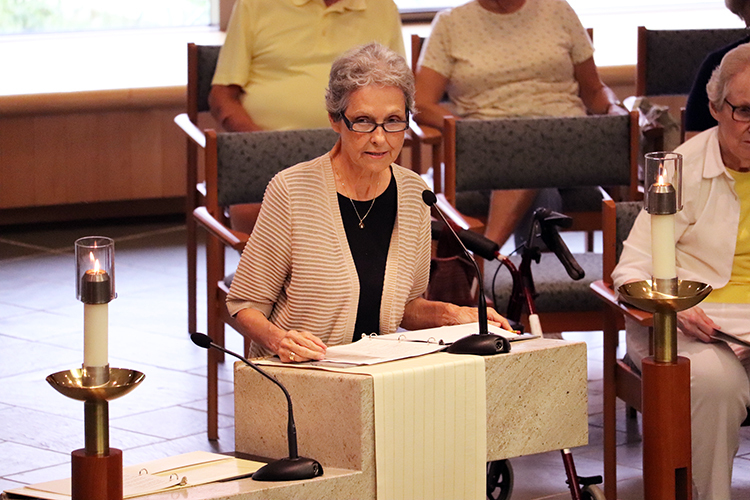 The weeklong gathering, held at the Adrian Motherhouse campus, included time for renewal and celebration, as well as workshops on issues of justice and peace. 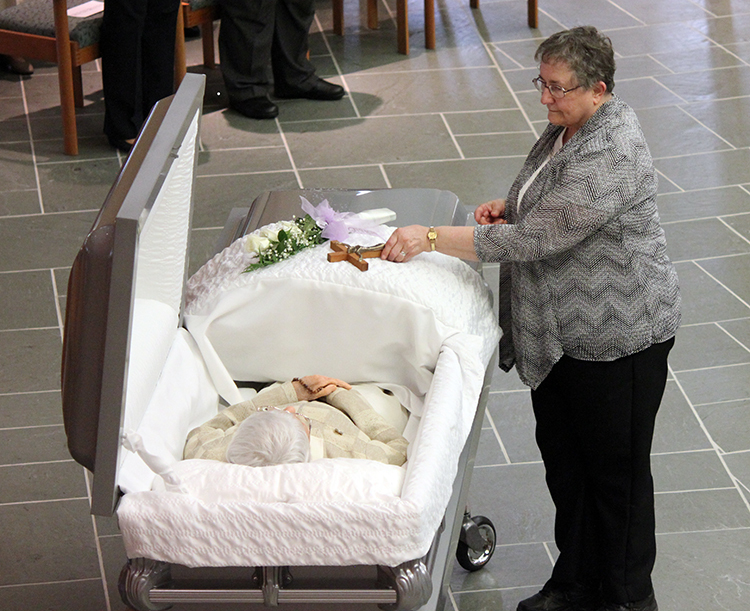 Sister Janet at the dedication of the renovated Holy Rosary Chapel. During Sister Janet’s term in office, the General Council initiated several major renovations at the Motherhouse campus. In 2000, Holy Rosary Chapel, then nearly 100 years old, was closed for restoration and re-dedicated in 2003. That same year, St. Catherine Chapel was built to replace a smaller chapel that had served Sisters living in the Maria health care facility. The third major building project involved renovating the Weber Retreat and Conference Center. Sister Janet’s six-year term encompassed the millennial celebrations; the September 11, 2001, attack on the World Trade Center; and the U.S. wars in Afghanistan and Iraq. During this time, the Congregation continued its engagement in social justice issues, including, among other initiatives, joining in the “Jubilee” call to cancel the debts of developing countries and in efforts to halt the U.S. invasion of Iraq. 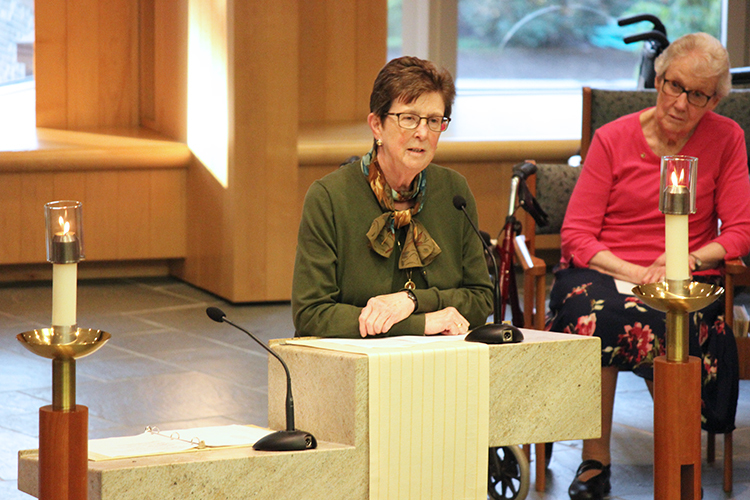 Sister Maureen Comer, OP, who served on the General Council with Sister Janet, described her as “wise, insightful of persons, accepting of others, and holy,” and a person with a great sense of humor and a broad range of interests. “She called others to know and live their best selves” and helped them to nurture their life with God, Sister Maureen recalled. Sister Janet began her ministry with the Adrian Dominican Sisters as a teacher in elementary and high schools in Florida and Marymount College in New York. She ministered as counselor for Adult Protective Services in Orlando, Florida, from 1981 to 1983. Following her service to the Congregation as Prioress, Sister Janet became Vice President of Sponsorship for Dignity Health Dominican Hospital in Santa Cruz, California, from 2005 to 2011. In this role, she educated hospital employees on the Mission and Vision of the Adrian Dominican Sisters and helped them integrate those values in their health care work. Sister Janet subsequently served as Chair of the Dominican Hospital Community Board, from 2012 until last year. Born in New York, N.Y., to Veronica (Hall) and Leonard Capone, Sister Janet graduated in 1955 from the Adrian Dominican-sponsored Rosarian Academy in West Palm Beach, Florida, and entered the Congregation on September 2 that year. She professed her first vows on August 5, 1957, and final vows on August 5, 1962. Sister Janet earned a bachelor’s degree in French in 1963 from Barry College (University), Miami, Florida, and a master’s degree in guidance and counseling from Siena Heights College (University), Adrian. Both universities are sponsored by the Adrian Dominican Sisters. She completed graduate studies at St. Louis University from 1972 to 1973. 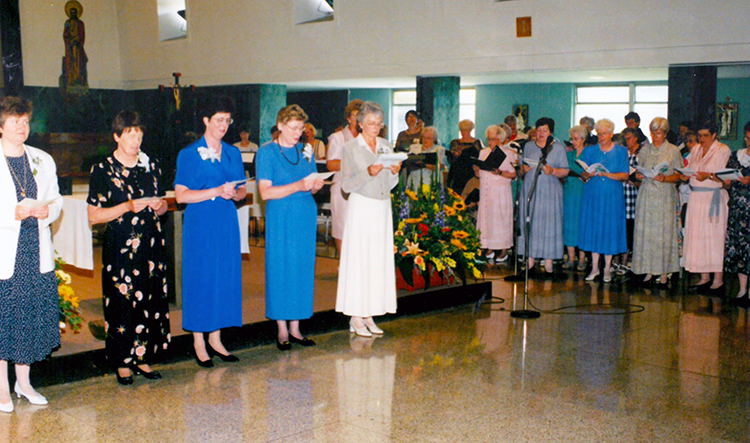 During the 1998 Transfer of Leadership ceremony, the new General Council takes office: from left, Sisters Barbara Rund, Kathleen McGrail, Maureen Comer, Molly Giller, and Janet Capone. Sister Janet is survived by a sister, Carole (Terrance) Frechette of Weston, Massachusetts, and six nephews and nieces. A Vigil Service will be held at 7:00 p.m. on Sunday, August 5, 2018 in St. Catherine Chapel on the campus of the Adrian Dominican Sisters, 1257 E. Siena Heights Drive, Adrian. The Funeral Mass will be held at 10:30 a.m. on Monday, August 6, 2018 in St. Catherine Chapel. 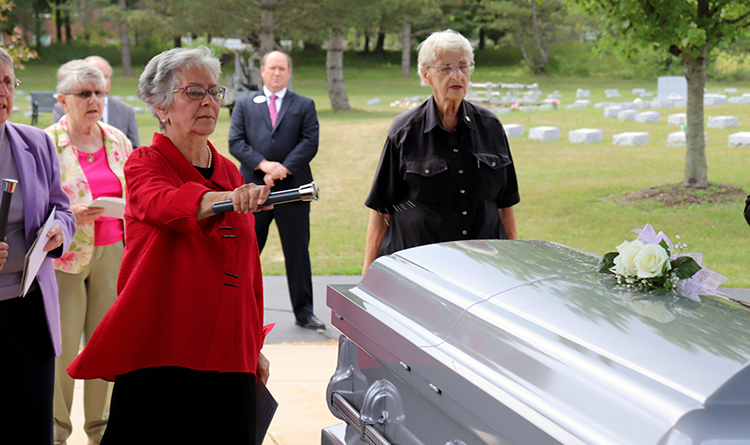 The Rite of Committal (burial) will be in the Congregation Cemetery. 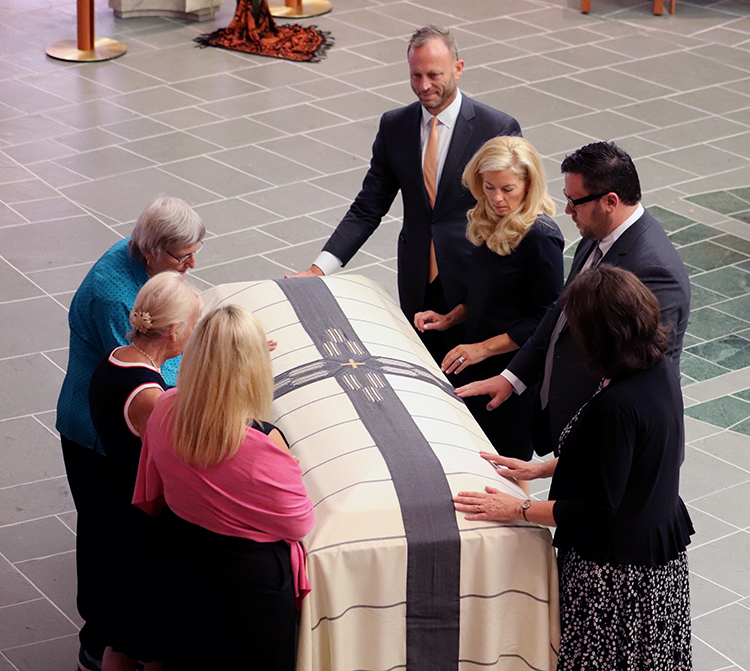 Click here to read Sister Janet's obituary. 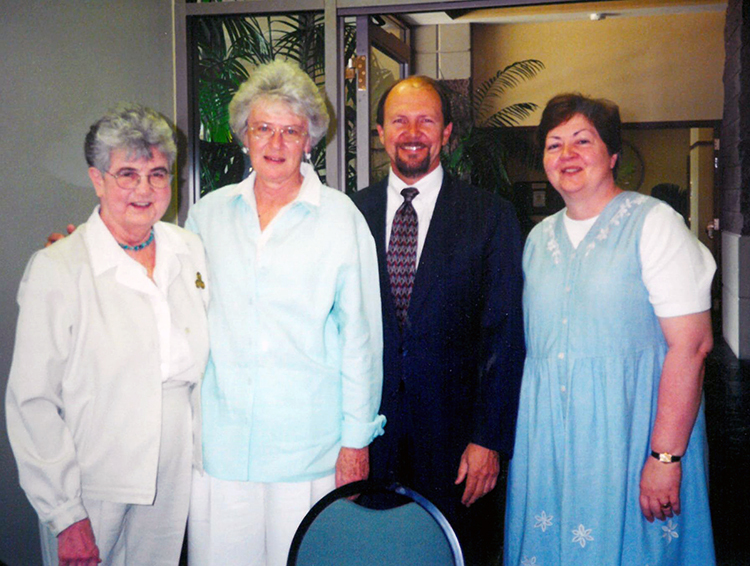 Rod Davis, CEO of St. Rose Dominican Hospitals, with, from left, Sisters Rosemary Ferguson, Janet Capone, and Patricia Walter, during the dedication of the Siena Campus, June 23, 2000. 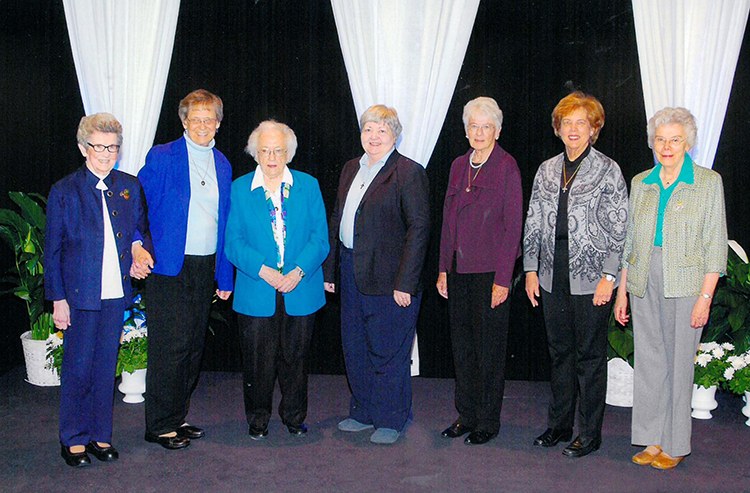 Former Prioresses in 2016 at the conclusion of General Chapter, from left: Sisters Rosemary Ferguson, Carol Johannes, Nadine Foley, Patricia Walter, Janet Capone, Donna Markham, and Attracta Kelly.